As a graduate of the EOF program, there are many ways that you can stay connected. From attending events to becoming a mentor, you can play a vital role in the success of our students. This may be the beginning of a wonderful relationship. If you would like to get involved or should you have any questions, please contact Carmen Reyes-Cuevas at cuevasv@montclair.edu. For more information on how to stay connected to your alma mater, visit the Alumni Relations website, or contact Stacy Albanese ’08, Office of Alumni Relations, at 973-655-5465. For information on career services, check in with the Center for Career Services. 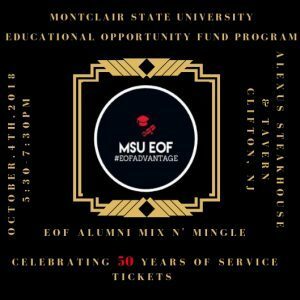 For more information about upcoming EOF events, please contact Gladys Valentin at 973-655-3039 or valenting@montclair.edu.